Convert, resize, transform, touch-up, rename your digital images in batch mode. 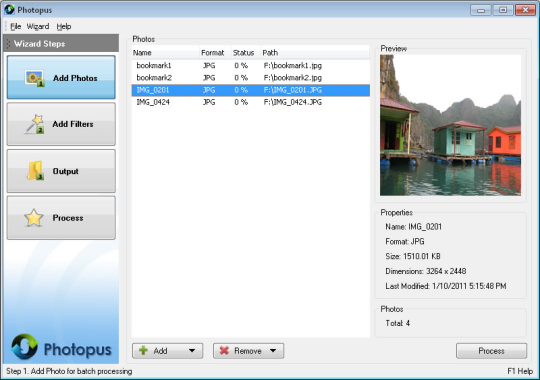 Photopus is a photo editing app that offers many options for adjusting, cleaning up, and adding effects to your photos. It contains a variety of filters and other tools that let you create sharp and distinct images, change the orientation of the image, and alter the border shape and size. The interface is uncomplicated and presents the general steps of the photo editing process in a clear manner. Carry out all essential tasks of the photography workflow and digital asset management in one place. Retouch or edit your images and photos. Make beautiful photos in seconds right in your browser. IMPORTANT: This app works with Windows 10 Pro and Home. A Powerful and Easy-to-Use Photo Editor.